I have been trying to encourage Immy to eat sandwiches for about 4 months now. She would eat a slice of bread or toast or the bottom half of a bun but not an actual sandwich. If I give her a sandwich she wiil pull it apart and eat the filling or lick off the spread. On Monday we went to a birthday party and there was a plate of sandwiches cut into miniature shapes. Immy nearly devoured the whole plate! 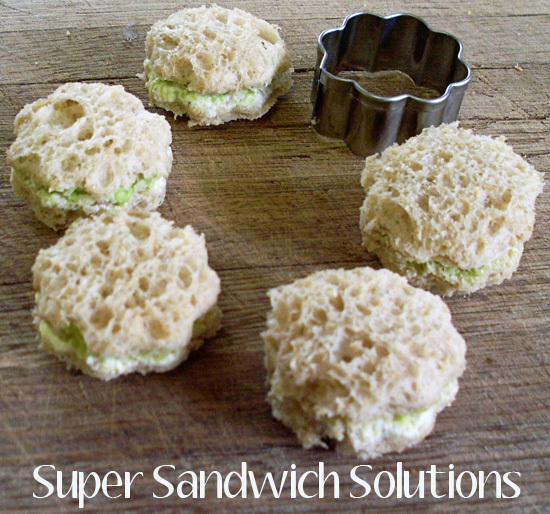 So now I make her sandwich and use a cookie cutter to cut it into mini shapes and she eats every single one, a super sandwich solution!